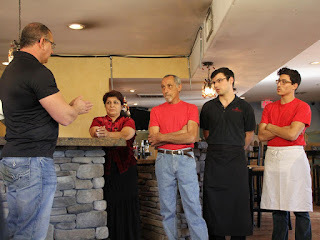 Chef Robert Irvine visits Sapori D'Italia in Fountain Hills, Arizona where he finds a restaurant in need of help with an outdated menu of bad food but also a broken family who argue loudly and in front of the customers. Owned by Gasper and wife Maria other members of the family (their two sons) also work in the restaurant, Gasper is in the kitchen whilst Maria is front of house but they constantly meddle in each others areas and are in $200,000 of debt. There is a reputation amongst locals for arguments in the restaurant which has damaged their reputation. The food is also poor with bland dishes on offer with prepared sauces and the service is poor as staff are left alone to work whilst the family disagrees with each other. The decor and menu is given a revamp but Robert mostly focuses on mending the fractured relationships amongst the family. Within a few months business had increased, $8000 a week for 3 weeks following the shows filming but this slowed to a steady $2000 a week increase. There are not only new customers but returning customers who love the new menu which still includes Roberts dishes but also customer favourites. The restaurant is open and reviews are very good on both Yelp and Trip Advisor. This episode was episode 7 of season 5 and was aired on January 23 2013, there were 13 episodes in the season, airing between November 2012 to March 2013 and the season 5 closure rate currently stands at 93%.